Attend the 2018 Art Basel in Miami in style with VIP Access. Want VIP Access to the 2019 Art Basel in Miami? Art Basel stages art shows for Modern and Contemporary works, sited annually in Basel, Miami Beach and Hong Kong. Each show has participating galleries, exhibition sectors, artworks and parallel programming produced in collaboration with the host city’s local institutions. Art Basel has been a driving force in supporting the role that galleries play in the nurturing of artists, and the development and promotion of visual arts. The atmosphere surrounding each exhibit is electric and the show’s and after parties are a page from Andy Warhol’s factory. 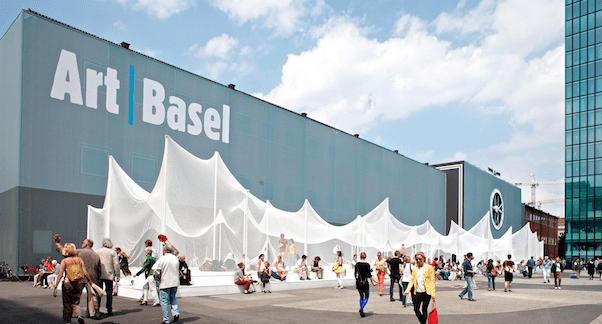 Founded in 1970, Art Basel provides a platform for galleries, giving them access to an international audience of collectors, museum directors and curators. The shows attract people with an appreciation of modern and contemporary art who experience Art Basel as a cultural event to be adored. In addition to showing exciting works by world-renowned artists, Art Basel is always innovating, thus expanding its platform for new artists who represent the vanguard of the visual arts. Its worldwide reputation – earned over the last forty years – for showing works of the highest merit, and attracting the world’s leading gallerists and collectors, has made Art Basel the place where the art world meets. VIP First Choice Fair Pass: VIP cocktail party access, exhibit preview night for VIPS and Celebs, VIP lounge access, VIP line access, special party access for VIP holders. VIP Pass holders will enter through a VIP entrance with no lines into a VIP lounge with food and drinks served all day. Includes various events all over South Beach. Client will receive a booklet of events with the VIP card (attached). The VIP Cocktail and exhibit party is held the day before the show opens to the public. ART BASEL EVENTS AND PARTIES!!!!!!! Luxury Private & Party Yacht Charters in South Beach (catered with premium bar services)…. Exclusive Luxury Toys & Experiences in South Beach Miami……. Get VIP Access to the 2019 Art Basel in South Beach, Miami!!! Witness for yourself what all the hypes about as you experience these exhibits with unlimited VIP access and hop from party to party. Not only can we get you into the hottest shows, we can also provide luxury transportation, five-star dining experiences and anything your heart may desire. You name it, we’ll make it happen for you. Contact us today for more information about the 2019 Art Basel in Miami.